Give your table a fresh new look with Newbridge linens. Newbridge makes affordable table linens in a variety of designer colors and patterns. The Newbridge table linens line is manufactured by Josie Accessories, Inc. The company has been in business since 1944 and operates the Elrene Home Furnishings line as well. The New York based company also manufactures home furnishings and accessories for kitchens and bathrooms, including tablecloths, placemats, shower curtains and kitchen decor. You can also find sesonal decor and table linens sold by the company. You might be surprised what a difference a simple vinyl tablecloth can make. Add some matching placements and a vase of fresh cut flowers for an easy and attractive table centerpiece. Newbridge vinyl tablecloths have a fleece backing that addresses a common problem with vinyl tablcloths, slipping on the table. You can find these tablcoths in a variety of sizes and shapes to fit most round, oval or square dining tables. Matching placemats are also available for each color. You can choose placemats in the same color as the tablecloth or go for a mix and match by choosing placemats in one of the other colors for a nice contrast. This pattern makes a lovely table setting for spring or summer. Fresco Fruit is an attractive pattern showing beautiful green vines and plump dark purple grapes. This style goes well with many decorating themes, including a wine lover's vineyard theme or a Tuscan, Italian or French country theme. The light beige background has a textured look that gives this pattern an old-fashioned or vintage feel. Matching placements are also available. The French Provencal pattern is very colorful and looks like it came right out of a quaint French countryside café. It has a multicolored background in shades of blue, red, yellow and green. The floral pattern also features colorful roosters. This is the perfect table setting for a country kitchen. The Lovely Lilac tablecloth with matching placemats is bursting with beautiful blooms of delicate lilac flowers in shades of pale yellow, rose and soft lavender. This tablecloth is perfect for spring and can complement a variety of decorating styles, including contemporary, traditional and cottage. Continue the look with fresh flowers as a centerpiece. This tablecloth also fits perfectly with vintage chic or distressed style furnishings. Fruit Decoupage depicts farm fresh apples, pears, grapes and plums among green vines and delicate blossoms. This pattern is another perfect accessory for a country or farmhouse style home. Imagine a big bowl of fresh fruit as a table centerpiece for this pattern. 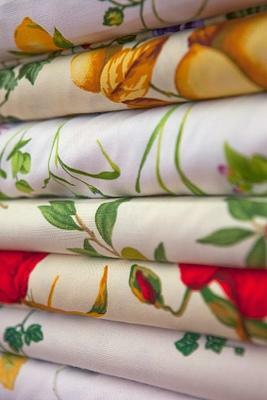 If you like a more subtle approach for a floral pattern, then the Peony Patch tablecloth is for you. Instead of being completely covered in blossoms like the Lovely Lilac pattern, Peony Patch has widely spaced Peony flowers in shades of pale yellow and purple. Delicate green leaves accent the flowers against a sage and light gold background. Although Newbridge vinyl tablecloths are easy to clean with just a damp cloth, the company also makes clear vinyl tablecloth protectors. These are good to buy if you have small children or do a lot of crafting at your kitchen table. The tablecloth protectors come in the same shape as the tablecloths and you can cut them if needed to fit the exact size of your table. Newbridge also has a table pad that can further helpt to protect your table. This flannel-backed pad is heat and liquid resistant. Bed and Bath Outlet carries the largest stock of Newbridge linens online. You may also find the occasional listing for a Newbridge tablecloth on sites such as Amazon and eBay. Newbridge tablecloths offer an interesting selection of prints that are fun and affordable additions to your table linens while offering you an easy care solution.